Reading through Shadowrun (20th Anniversary Edition) this week, I was struck by two things: firstly, at the well-described and well-presented details of the setting and, secondly, at how the setting has evolved over time. There is a level of verisimilitude is the stories and setting details described. The Shadowrun book opens with 59 pages of background, stopping only briefly at the opening to tell us what roleplaying games are about. You are immersed in details and stories, should you choose to read them. It's a delight! Additionally, Shadowrun has rolled with the punches that technological development gives to an old Cyberpunk setting. In an increasingly wireless world you read about a wireless future - one written some 4 years ago just as the wireless world was getting into first gear. 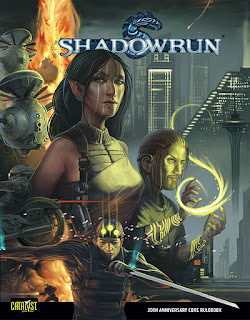 These developments seem to both respond to technological development as we know it but also to the needs of players of the game: this iteration of the game fixed many problems with the older version... and the next iteration, the imminent Shadowrun 5, purports to do the same. What makes a setting feel immersive? Let's get the elephant in the room out of the way: Shadowrun has had 20-odd years of play and development behind it. Any setting that we create might be brand new. We can't ignore the fact that time spent in a setting allows time for the setting to develop and take form. And this wasn't always a cool game... it had a dark night too. Yet... the question is a useful one. Reading Shadowrun what struck me most was the attention to small details. Little out boxes with lists of brand names for night clubs are a nice example... and inside those clubs, lists of the top drinks and their nuyen prices. I didn't spend much time on those boxes but I was struck by how immensely useful such little details might be when you're trying to bring the setting to life. Second on my list would be the use of one viewpoint to present the over-arching setting history. The style was engaging, written as a primer for wannabe Shadowrunners, but also implied that what you were hearing might not be the whole truth. There were multiple plot lines and event sequences described, giving the impression of the third thing that I'll talk about in a moment. What I liked about the style, however, was that by combining this narrative with three longish pieces of fiction the authors presented a world from at least four different viewpoints... and made you want to go and explore it for yourself. ...Storm Front summarizes and updates the major ongoing plots in the Sixth World, while introducing a new thread that will shake the world in the near future. Meta-plots are something which I always had mixed feelings about. When I worked for GW (many moons ago) I was involved in running two of the annual Warhammer 40,000 global campaigns, developing and presenting a new meta-plot within the setting. At the time it was both exciting to be creating new stories through our gaming... but it was also something which annoyed a lot of fans. While some folks love the ongoing development of the setting through story, many are happier with the status quo. Nowadays I feel that, although I've missed out on all the stories told in the Shadowrun line past, the sense of life that these tales give to a setting is powerful. Thinking back across the years of gaming, Traveller did this too... and, love or hate the Virus, it was a big and powerful part of what made that setting cool too. The fact that games like D&D have cottoned onto this in later years is testament to how effective it can be in involving fans. Narrative breeds narrative, after all. Micro details that add a sense of reality to the game. Viewpoint sketches of historic and present conflicts. Having at least one meta-plot bubbling away. Making a list of possible brews that fit our fantasy taverns, or making sure that the SF setting has a selection of cool Corporation names seems like basic GMing. Yet, and this is a hard truth, I don't make the time to do this... I wait until I need a detail and then throw it out there. Designing some useful micro details and using them consistently will help to bring the game alive. I think I'll listen to the questions that players ask to guide my writing, though - no point creating something you don't need. Writing up sections of background from a single viewpoint, or of a few different viewpoints over time, is another nice technique. I tend to opt for third-person top-down descriptions of history. It is far more effective to create a viewpoint character and write things from their more limited but much more interesting standpoint. Finally, and this is easier for me that I realise, I need to have one or more active meta-plot lines bubbling away. Whether in fantasy or SF, things larger than the heroes will make the worlds seem more alive and real... and threatening. It also allows the heroes moments in which they can step up and take an action within that plot, affecting it for good or ill. That's the stuff that legends are made of... and that good roleplaying cries out for. What about you? Do you think I'm onto something? Is there something I missed?